What Run Oregon is Reading: Every. Single. Day: Unstoppable Wisdom From a Year of Running. A running streak isn’t anything new, but Every. Single. 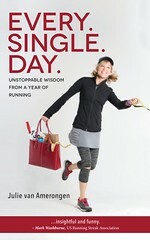 Day: Unstoppable Wisdom From a Year of Running is the first book I’ve read journaling the 365 day experience. The author, Julie van Amerongen, is someone many of us could relate with, a parent trying to juggle work, kids’ schedules and activities and maintain a mile a day. I could relate in so many ways with van Amerongen, but it was especially fun that she lives in the Portland area and many of her entries involved weather patterns I’m all too familiar with and running spots I know. While the book is mostly about the daily mile, there are definitely moments that pull at your heartstrings. “Streakers” all have their own reasons for lacing up every day and van Amerongen is no exception. Her streak didn’t start because of an article in Runner’s World or a New Year’s resolution, it was more of an evolution. I was in tears within two chapters of this book, which wasn’t expected. This running evolution was sparked after losing her close friends and business partners. The trio had launched The Practice Project, a collection of interviews with business leaders, artists, musicians and athletes to encourage a commitment to personal growth. Soon after, one partner passed away from glioblastoma and within two days her other partner passed away from a heart attack.As a coping mechanism, she put The Practice Project into practice. For one month, van Amerongen would try out new things and learn new skills. It took her out of her comfort zone, but most importantly kept her busy and focused on improving her life. The running streak started as a one month challenge, but grew into a year long passion. Most people would argue that running every single day is crazy, but after reading this book, I can see the attraction. The discipline alone would be satisfying, but after looking back at her year of running, I’m thinking it’s not all that crazy.There were days she had to head out for a run after skiing all day, times she had to run at the airport to make it work and a few mornings she had to clear out a foggy brain from too much wine the night before. Like all of us, van Amerongen has a crazy life schedule, but she made it work. She prioritized and didn’t give herself an out. It’s not that she was taking up running for the first time, she ran the Eugene Marathon and was very familiar with the long weekend runs, but, like many of us, got out of the habit as soon as that medal was earned. The one mile concept was much more appealing, in ways more challenging and in ways more attainable. Regardless, there is a sense of pride that comes with fulfilling a year long running challenge.I loved that van Amerongen was a genuine person that I could totally relate with, a busy mom trying to fit it all in. Track meets, family vacations and long business conferences didn’t stop her streak, which inspired me. She was funny, relatable and, best of all, inspired me. I loved the concept of The Practice Project and was so excited to learn of The Portland Stairs Book. I had no idea there was an entire book devoted to stairs in the Portland area. She includes small nuggets of knowledge all the way through, with book selections and movie suggestions to help motivate and inspire. Newbie runners will enjoy her gear suggestions and she includes tips she learned that even seasoned runners will appreciate. This woman helps rescue dogs, loves Lululemon and quoted Sean Astin, so I might be biased as I feel like we’re kindred spirits. I think that’s the fun part of this book, most people would feel that connection with van Amerongen. She made me laugh, cry, but most of all inspired me to grow in running and in life, one day at a time. Just keep moving Every. Single. Day.